≈ Rare, Medium or Well-Done . . . Automatically! 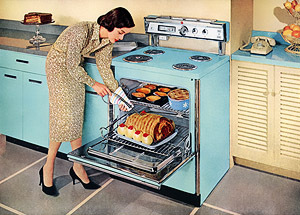 G-E’s Keyboard-Cooking Ranges for 1958 are available in 30- and 40-inch sizes. Four Mix-or-Match colors and white. Make all your cooking easier with these work-savers: Meat thermometer buzzes when roast or steak is ready. “Piano Key” pushbuttons bring you G-E Speed Cooking. Automatic unit watches your frying and boiling. Oven’s so big it bakes four pies on a shelf . . .
Who needs a $60,000 kitchen renovation when you can have this? We’d like ours turquoise, please. And medium rare. There’s a brand new trend in eyewear today — a fresh, young look that does something for you! It’s “showpiece styling,” created for you by the nation’s leading designers. To give you an idea of what fashion-right eyewear can do for you, here are just a few styles from American Optical’s remarkable selection: 1. THE CLIC — for that “glance of glamour,” this striking design frames your eyes in mystery. 2. THE ROYAL PRELUDE — contemporary classic enhanced by sculptured aluminum plaques. 3. JEWELED ROYAL GAYMONT — the sparkle of jewels in this aluminum and gold-filled beauty puts new sparkle in your eyes. 4. THE ROYAL CLIC — elegance in aluminum trim — smart complement for day or evening. 5. THE DOMINO — Coming soon. Its charming simplicity is subtle flattery for a pretty face. 6. THE FROST PRELUDE — a study in sophistication, with upswept tips and frosty highlights for added enchantment . 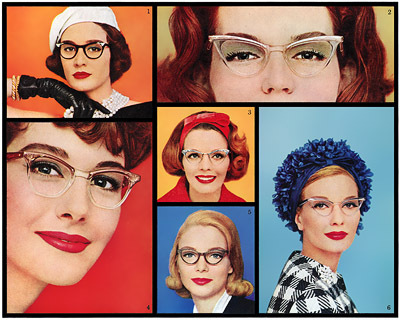 . .
From 1959 and American Optical, the ad that influenced a generation of librarians. Vast sums of money and vital scientific data ride on the reliability of Bell Aircraft’s rocket engine for Lockheed’s Agena satellite, second stage of the Air Force Discoverer series. The Agena engine, designed with space in mind long before space became a household word, has fulfilled its every mission and placed more tons of useful payload into orbit than any other power plant. This Bell engine now has re-start capability — the first in the nation . 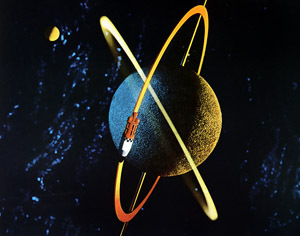 . .
From 1960, a quintessentially retro rocket orbiting the Earth in an analogue to the classic atomic-age image of electrons circling a nucleus. Très geek! Despite the sky-high transportation costs, Lunar manufacturing should prove economically viable. With unlimited solar power, controlled atmospheres and advanced automation, a considerable commerce could be realized in delicate instruments, rare minerals, reactor cores and other items that might be more efficiently processed or produced in the Moon’s perfect vacuum. 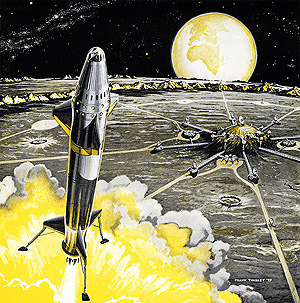 To supply the Moon colonists, and to carry their production back to Earth, special rocketships will be developed. Nuclear energy is the most promising source of propellant power. The ship shown here utilizes nuclear fission for heat and hydrogen gas as a working fuel. From pressurized tanks, the gas is fed through a heat exchanger, expanded, and expelled for the motive thrust. When the craft leaves Earth, it carries only enough gas for a one-way trip. For, by extracting hydrogen and oxygen from lunar rocks, Moon settlers could refuel the rocketship for the return voyage. This will permit smaller fuel tanks on the craft and larger payloads. Inertial navigation systems will play an increasing role in the exploration of outer space. Arma, actively supporting the Air Force’s program in long range missiles, is in the vanguard of the race to outer space. 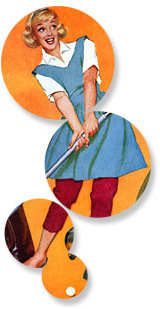 From 1959, another of Frank Tinsley's monochrome illustrations for American Bosch Arma. This is the world of Union Carbide, bringing you a steady stream of better products from the basic elements of nature. 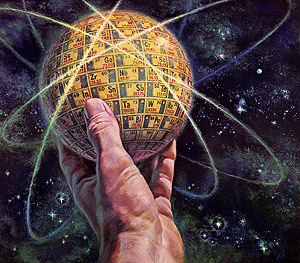 The Periodic Table shown in the illustration lists all the known elements of the world we live in — more than half of them used by Union Carbide . . . 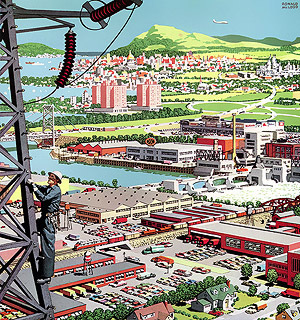 The giant Union Carbide hand in 1960, one of hundreds of hand-themed UC illustrations that ran from 1950 to 1963. 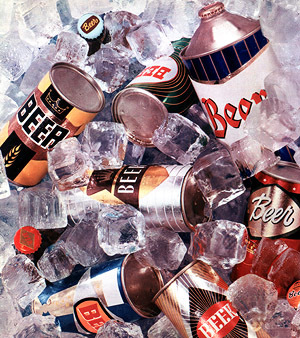 A chilling tableau of assorted Beer-brand brewskis from 1955 courtesy of Continental Can, back in the days before the pop top or screw-off cap. Pepsi-Cola. It refreshes without filling. You’re one of the Sociables. Have a Pepsi anywhere — at play, at home or at your favorite soda fountain. 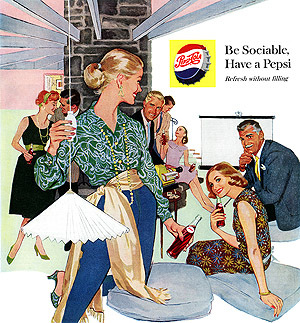 In 1959 nothing said hospitality quite like a slide show and Pepsi straight from the bottle. Ice cream, anyone? From 1959 and the dawn of the jet age, a quaint reminder of the days when there were ashtrays in armrests and the airlines gave you real silverware (and real food). 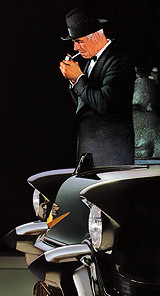 ≈ Why Buy Just Half a Fine Car? Are you missing half the fun of a fine car — the better half? We think you are — unless you’re driving a new Nash Ambassador! For it isn’t only the sheer beauty of Pinin Farina’s continental styling that makes Nash so thrilling nor even the excitement of its Super Jetfire power. 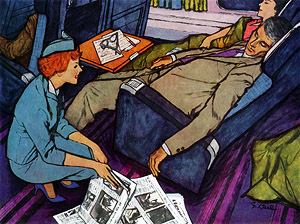 Here — in a Nash Airflyte — you step into a whole new world of travel pleasure! Imagine travel in reclining seats (widest in any car) that banish fatigue . . . let you nap while others drive . . . that give you a “twin bed” cabin in the woods at night, even insect screens . . . 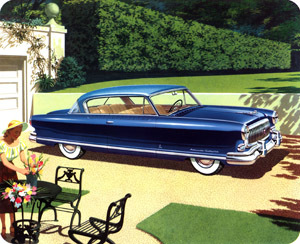 The Nash Ambassador Airflyte Country Club coupe, parked this sunny afternoon at 1953 Lois Lane. Tops for the “top-down” days ahead . . . the Classic Ninety-Eight Convertible by Oldsmobile. It’s youthful, gay, carefree — and styled to look the part. Rakish lines and bold contours are gracefully proportioned to achieve true Classic design. What’s more, this spirited beauty acts the part, with the smooth, hushed response of the mighty “Rocket” engine, with effortless Power Steering and Pedal-Ease Power Brakes (optional at extra cost). You’re cordially invited to drive this Classic Convertible. Visit your Oldsmobile Dealer soon. From 1953, the Olds 98 convertible at what looks like Miami Beach’s Fontainebleau Hotel, set to open in ’54. Or maybe it’s a cycle. 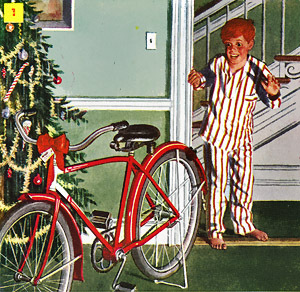 From Christmas 1946, a witty four-part parable by our old friend Philip Dormont showing the red-letter days of a certain red-haired young man as he grows up, gets married and has a car. ≈ How to Enjoy the Sun . . . in Style! 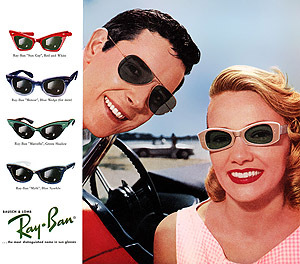 A nifty illustration showing six styles of Ray-Bans: The G-15 aviator-style sun glass worn by the man on the left, the “Satire” in Tan and White worn by his blond friend, and, from the top, the “Sun Gay,” the “Meteor” Blue Wedge for men, “Marcelle” in Green Shadow and “Myth” in Blue Sparkle. $6.50 to $24.95 at fine stores in your community, if you happen to be reading this in 1960. Summer is for swimming and sunning and loving and living . . . and twosomes like this and swim suits like these to inspire twosomes like this. Read that three times, and even if the rest of you stays put on the beach, your head will be swimming. 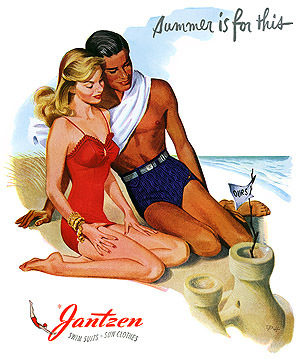 From 1946, another of Pete Hawley’s great illustrations for Jantzen. A 1958 rendering of Your City in Your State by Ronald Norman McLeod, whose career as an illustrator spanned almost half a century. Last night we parked ourselves in front of the televiewer to watch the unveiling of the buried 1957 Plymouth in Tulsa. She was kind of a sad sight after 50 years underground, but there didn’t seem to be any holes in the sheet metal. From the looks of the water line along the side, the leaf springs in back gave3 way quite a while ago. (But who knows how she’ll look after some TLC and a six-figure restoration?) 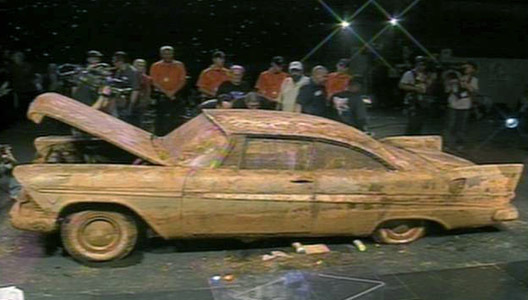 It was a fun show in any event, what with the opening of the time capsule, which unlike the car and its vault did not fill up with water. We were happy to see that the American flag inside was perfectly preserved. We were amused when emcee John Erling, holding it aloft, called Old Glory “Old Faithful.” Perplexed to hear him say it had 46 stars. Puzzled when the New York Times reported that remark as fact. Then we saw where at least two news organizations — CBS and the San Francisco Chronicle — headlined the story as “1957 Pontiac Unearthed in Oklahoma.” Guess we can't be too picky. 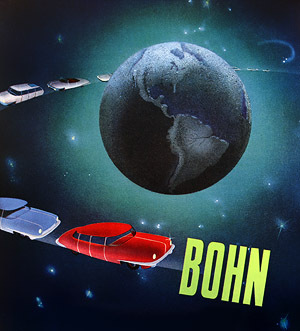 Most of the illustrations for Bohn Aluminum’s 1940s ads were unsigned, but this airbrush rendering, from 1947, is an exception. It bears the all-caps signature KORT, about whom we can find no clue. ≈ Never a Car Like Packard — And Never a Packard Like This! The way people are crowding into our showrooms to see the new 1951 Packard, you’d think they had never seen a new car before! And they haven’t! Never a car like this daring new Packard! Your first glance tells you why Hollywood’s famed Society of Motion Picture Art Directors selected the 1951 Packard with Ultramatic Drive as the most beautiful car of the year. And so practical, too — from the new low-level bonnet and Guide-line fenders (for safer parking and passing) to the mammoth new luggage compartment. You’ll get another lasting thrill from the stunning new Fashion Forum interior. So amazingly roomy, so luxuriously appointed . . .
After the debacle of the 1948-50 “pregnant elephant” or “bathtub” Packards, so called because of their bulbous, slab-sided styling, the 1951 cars were a breath of fresh air. 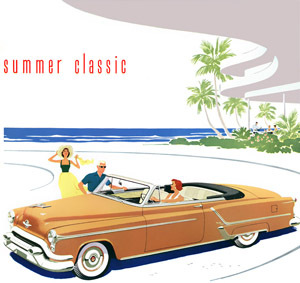 The results of a stem-to-stern makeover, the last before Packard’s demise as an independent manufacturer, the car served as the basis for the beautiful 1955-56 models. A one-page gallery of the Gift Shoppe’s greatest hits. Enjoy. 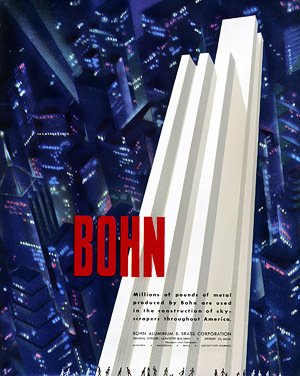 Another stunner from the anonymous genius who illustrated for Bohn Aluminum in the late 1940s. This one is available as a fine-art print.